TOP TO BOTTOM: Upon arriving in Church Rock, N.M., presidential candidate Duane “Chili” Yazzie of Shiprock, N.M., makes his way into the convention center for the Navajo Nation Presidential Forum on Aug. 18. 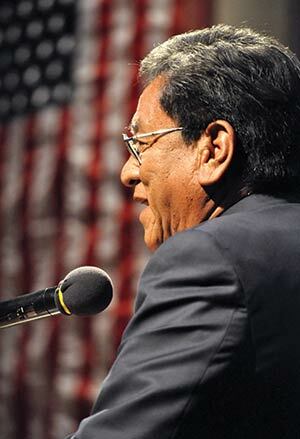 Navajo Nation Presidential candidate Russell Begaye introduces himself on Monday at the Navajo Nation Presidential Forum in Church Rock, N.M. Standing at the podium, Kenneth Maryboy listens to his question being asked during the Navajo Nation Presidential Forum in Church Rock, N.M., on Monday. Vying for presidency, Kee Yazzie Mann of K’ai’bii’to Chapter speaks to attendees of the Navajo Nation Presidential Forum held on Monday evening in Church Rock, N.M.
A week before the primary election, most people probably knew whom they were voting for if they hadn't already voted early by mail. But that didn't stop more than 600 people from turning out for the fifth and final presidential candidates' forum sponsored by the Navajo Times and KTNN/KWRK. "They probably just came out to enjoy it," observed candidate Russell Begaye of Shiprock. "They want to be part of the event." It's true Navajo Nation politics are hotter and more entertaining than an evening at Fire Rock Casino and you only had to drive a few miles farther to Red Rock Park. The barbs, the bluster, Edison "Chip" Begay's uncanny way of stirring the crowd into a frenzy, KTNN's Ray Tsosie's unheeded pleas to not "yell into my radio" É from an entertainment perspective, the evening did not disappoint. For the handful of undecided voters who were hoping to hear something new to sway their allegiance, however, there wasn't much there. As Begaye noted, the panel of questioners was different but most of the questions were much the same as in previous forums. And so were the answers. 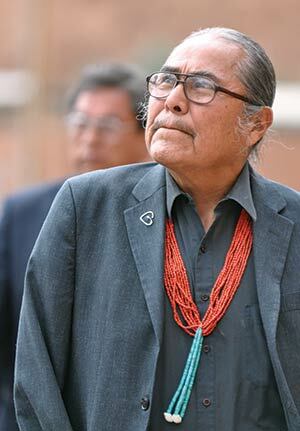 Duane "Chili" Yazzie continued to press for a complete re-creation of Navajo Nation government; Carrie Lynn Martin once again touted local control; previous leaders held up their accomplishments while Moroni Benally railed against "the status quo." There was a bit more interaction between the candidates and the panel, with Moroni Benally chiding Navajo Nation Museum Director Manuelito Wheeler for "wasting" a question ("If you could bring either George Strait or Metallica to the Navajo Nation for a concert, which would you choose?"). And candidate Cal Nez demanding Navajo Times Editor Candace Begody to ask her question in Navajo ("I'm one of the examples you guys keep talking about," she shot back, referencing the candidates' lamentations of language loss among the youth). There was just a glimpse of audience heckling: When candidate Chris Deschene declared he was willing to discuss any issue with anyone, someone toward the front asked, "Desert Rock?" -- the unpopular proposed power plant Deschene came out in favor of a few years back. "Absolutely," responded the unruffled candidate. Gallup Mayor Jackie McKinney opened the forum with a brief welcome address, noting that he was "looking forward to working with your selection" for president. Kee Yazzie Mann: Some programs aren't working, like Head Start. I will fix Head Start. Christopher Deschene (responding to a question on the Diné Sovereignty in Education Act of 2005): There are issues with the 2005 Sovereignty in Education Act. There is no comprehensive policy that accounts for protecting and preserving our culture. It's all in one jurisdiction, and already we have issues about jurisdiction. We don't have a comprehensive policy that covers pre-K. We may not be ready because the laws aren't there. It may invite more chaos. Hank Whitethorne (responding to a question about school bullying): Separate them (the bullies), give them something to do. Have them release their tension. Make them see that hurting other people is actually hurting themselves. Cal Nez: I'm against it. Donald Benally: It's not going to work because the people weren't involved. Ben Shelly: We need to bring in the medicine men. If the elderly don't have no input, I will veto it when it comes to me. Carrie Lynn Martin: I believe it's on the right track. When the communities and ranchers came together (at a recent meeting) and learned of the data, we were able to be educated (on the effects of overgrazing). We as Diné do not take care of our animals. What I think we need is, again, local government. Dan Smith: It comes down to personal responsibility. Your government can't do it for you. Thank you (community activist) Leland Grass for standing up for these animals. Cal Nez: I don't believe in suing our way to sovereignty. Moroni Benally: What I've been talking about, what I've been writing about for years is that it's based on a myth that the white people have already owned this land. They put chains around us and said, 'You can do whatever you want in that corral, and we'll call that sovereignty for you.' We just tear down the walls. We walk away from the BIA. Donald Benally: We need to exercise our rights and start acting like a sovereign nation. Thirty years ago, the Navajo Nation was considered the most powerful Indian Nation in the country. When we presented our demands, we were respected. We gotta stop kneeling down and stand up like a sovereign nation. Carrie Lynn Martin: "We need to have housing for our older generation. They have been waiting so long. Us younger ones, let us do the best we can." Kenneth Maryboy (responding to a question about whether the Navajo Nation Council should tighten the reins of the Navajo Housing Authority): We'll just be in the way. We're not businesspeople, we're bureaucrats. Myron McLaughlin: Police are limited. Prosecutors are limited. Poverty is a cause. No jobs is a cause of that violence. Sometimes the dad is working outside the Navajo Nation, leaving the mother with all the children to deal with. We need to go back to our traditional teachings. Kenneth Maryboy: Women should be valued. Mothers are special. We should care for our mothers, our women. There is money available from the counties and from the Navajo Nation. The laws need to be enforced. Moroni Benally: We are a matriarchal society, but we have started to think in a very masculine way. Two out of three women are victims; that needs to change. The reauthorization of the Violence Against Women Act is good, but the Major Crimes Act limits us to (crimes punishable by) up to a year in prison or up to a $5,000 fine. If a non-Native man hurts our women, they need to go to jail for years. Two out of three of our LGBT brothers and sisters have also been the victim of violence. Edison "Chip" Begay: We don't value our women. We don't speak for them. There's women police officers. There's women bull-riders. We depend on our mothers to raise us. Cal Nez: We need infrastructure, and we need business know-how. I've lived it. Unite the Navajo Nation and business -- that would work. Dan Smith: I'd start by using all that money that Workforce Services got that Golden Hammer Award for. Think about how we can use our youth. You gotta give the youth something that is their passion. They gotta do what they love. Put that money where they need it. Edison Wauneka: It needs to be in the home environment. I'm guilty of that (not teaching his children Navajo). We have to speak the language. We have to include them (young people) in the chapter meetings. Right now, it's not clear to them why they should learn Navajo. Moroni Benally: Half the candidates here should be women. Dale Tsosie: Women think for themselves. If they don't want to assume leadership positions you can't make them. The door should be open rather than make (affirmative action) laws. Russell Begaye: We did several MOUs with the border towns. We need to make sure those border towns are complying with the MOUs. We need to work with the states, so the Navajo Nation Police will have the same authority as the state troopers. That's Indian Country. I'd love to see the Navajo Nation Police coming into the city of Farmington, the city of Gallup, protecting the Navajo people. Duane "Chili" Yazzie: Our government is based on white thinking. It's not Navajo -- that's what makes it difficult to do anything. 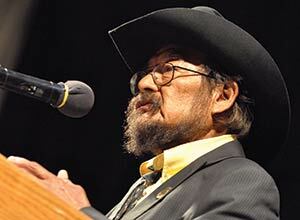 We need a government based on Navajo thinking. Dale Tsosie: We need a plan and we need to work together. We need a 10-, 20-, 50-year plan. Edison Wauneka: To get a home-site lease or a business-site lease, you still need to go through the (Section) 164 process. Our young, educated children, get them involved in the decisions. But the turnaround needs to be quicker. Donald Benally: The authority is in Window Rock, not at the local level. Even water and land are not at the local level. Turn that power, the decision-making to the chapters. Christopher Deschene: Leaders don't lie, cheat or steal. We need better leadership, and we need more internal controls. Kee Yazzie Mann: Tonalea Chapter has no chapter house. For three years they've been meeting in a warehouse. They got money, but they don't know what happened to that money. That's not right. Joe Shirley Jr.: We need to place trash bins in strategic locations and say, 'Dump your trash here, free of charge.' Hank Whitethorne: We tried that in Shonto Community Governance. We put up a dumpster with a fence around it. It disappeared. We need a public works department to oversee sewer lagoons, utilities and trash collection. Cal Nez: Infrastructure -- community development -- a public works department. Taxing authority: People have got to use it and know how to use it. We need to take some fiscal responsibility. We've been looking at this problem for the past 12 years or so. Myron McLaughlin: It was reduced out of retaliation. Council delegates that take care of five or more chapters, how can they do that? Forty-eight -- that's a good number. Duane "Chili" Yazzie: The white way of government is over. We need a complete change of structure and form and process. We are Diné, we have our unique thought process. Joe Shirley Jr.: We need a tracking system, a way to follow up with each student Hank Whitethorne: Diné College, Navajo Technical University -- send them there first. Kee Yazzie Mann: We have our own schools in our backyard. Streamline the money, make it easier for them. Begody asked the candidates whom they are considering for their running mates and whom voters should vote for if not for them. Cal Nez: That is totally unfair. I'm thinking about this. That's too presumptuous and very arrogant. Don't vote for anybody, stay with me. Ben Shelly: Re-elect Shelly/Jim. I have a running mate and I have a campaign manager. This man is ready to go. 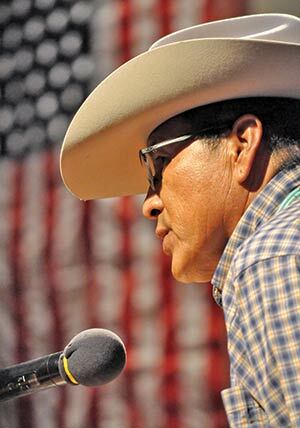 Edison "Chip" Begay: New generation leadership. We don't want to steal from the people. Carrie Lynn Martin: Enforce our disability act. They do have challenges. I'm really about local governance. I want to account for every Diné. Every chapter does their own census. That way we know where the needs are. Christopher Deschene: If we're going to take over '638 management of our hospitals, we can make sure we not only comply with the Americans with Disabilities Act, but also have Medicare and Medicaid facilities. Hospitals need room to expand. Myron McLaughlin: We're not meeting the Americans with Disabilities Act. We don't have sidewalks, we don't have access to buildings. The laws are there. Our grandparents should also be considered, their physical needs. Dale Tsosie: We do have resources. We have to consider the land and the people. Duane "Chili" Yazzie: The government of today has been dependent on resource extraction. (To have a government without it) we would certainly have to go back to some of our indigenous ways. We could go to solar, wind power. We could go back to the earth a lot more. Kenneth Maryboy: Develop a long-range plan. Take care of our land to reserve resources for our children. Dan Smith: I wouldn't even be at that table with them (states and municipalities) if I had my choice. We need to make them realize that this water's going to have to flow through our land and we need it. We can dip our bucket in that water any time we please. Edison Wauneka: I'd bring them both, one one time and one another time. Moroni Benally: With all respect, this is a waste of a question. People are living in poverty. They can't afford a $50 concert ticket. Russell Begaye: I guess I'd bring Stateline! This question is about how do you bring the older generation and the younger generation together, modern ways versus traditional ways? We will be the connection between the old and the young.